Following 90 days of bargaining over the terms of a new National Agreement—culminating in a week of intense negotiations—NALC and the U.S. Postal Service announced tonight that the bargaining period would be extended beyond the midnight expiration of the 2011-2016 contract on May 20. During the extended period of negotiations, the terms and conditions of the 2011-2016 contract will remain in effect. 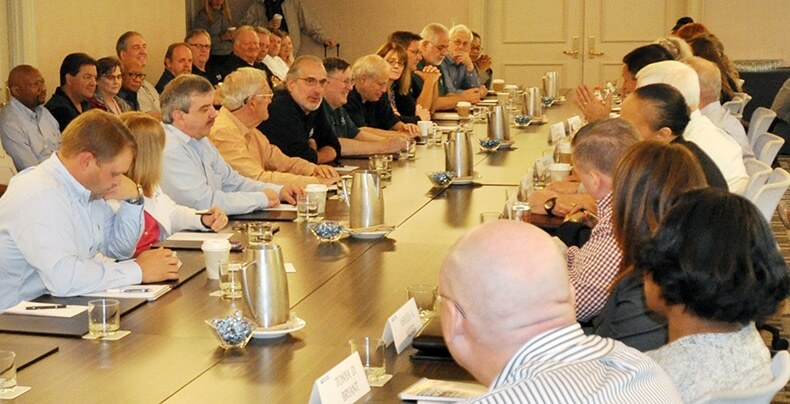 The intensive discussions we’ve had over the past three months—both at the main table on key economic provisions, and among the numerous committees composed of NALC Executive Council members and management representatives—have been productive and professional. Although we cannot say definitively that we will be able to reach an agreement without resorting to the law’s mediation and interest arbitration procedures, there has been tangible progress and both sides remain committed to attempting to reach a mutually acceptable tentative agreement. What is at stake in these negotiations? Obviously, setting wages that reward all letter carriers—career and non-career alike—for their exceptional contributions to the Postal Service’s essential service to the people and businesses of the United States is the most critical issue. Years of hard work and dedication by America’s city carriers have positioned the Postal Service to meet the evolving needs of the nation’s mailers, shippers and citizens. The inadequacy of city carrier assistant (CCA) wages and the need to improve career conversion rights for CCAs are glaring problems that must also be addressed. Repairing and improving the work culture in carrier stations across the country also is a major focus of our contract talks. We are negotiating at a time of great challenges and great opportunities for the Postal Service of the 21st century. The Postal Service must evolve to become an indispensable public utility for the internet age, and it is NALC’s responsibility at the bargaining table to shape that evolution constructively—both to improve service and to assure the Postal Service’s long-term viability, while strengthening the terms and conditions of America’s city letter carriers, the nation’s most trusted workers. Our bargaining team is acutely aware of this responsibility and is committed to fulfilling it. As long as we see a path toward success, we will stay at the table and work as hard as we can to reach a new National Agreement. This entry was posted in City Carrier Business, General Union Business and tagged City Carrier, Collective Bargaining Agreement, Contract Negotiations, NALC, NALC President Fredric Rolando, National Association of Letter Carriers. Bookmark the permalink.